Remove the front side door window outer sealing strip. Refer to Front Side Door Window Outer Sealing Strip Replacement. Use masking tape, tape off the outer door frame and applique to prevent scratching. Remove the front side door water deflector. Loosen nuts so that the window can be removed from the guides. In order to remove the window out of the frame, carefully grasp and tilt the window as you guide the window up and forward. Lower the window to align the guide nuts with the access holes in the inner door panel. 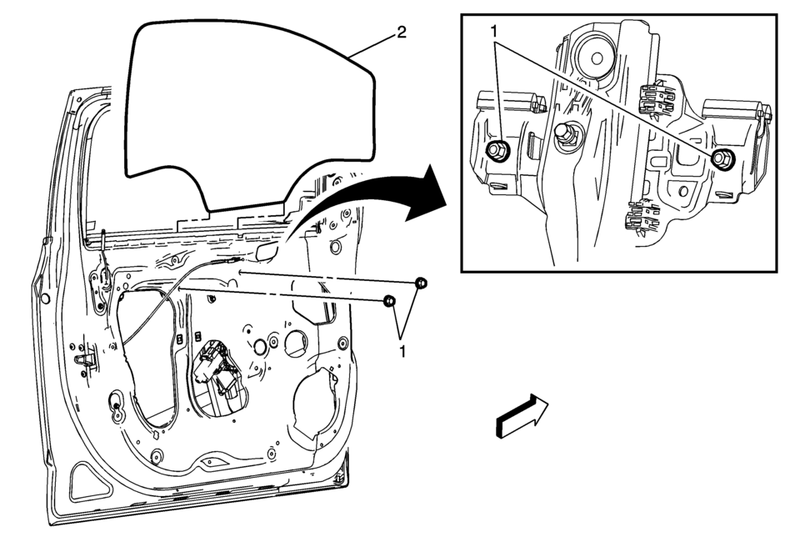 Do not operate the regulator motor without supporting the window. Ensure that the window remains in the guide when operating the regulator motor. Carefully move the regulator upward for short slow intervals, while ensuring that the window remains in the guide. Inspect the window for proper operation before installing the trim panel.